HDFC Bank on Saturday reported a 20.32 per cent increase in its net profit for the October-December quarter, on a year-on-year basis. 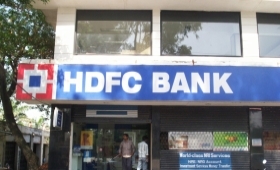 Its net profit for the third quarter (Q3) of financial year 2018-19 stood at Rs 5,586 crore, against Rs 4,642 crore reported during the corresponding period of 2017-18, HDFC Bank said in a regulatory filing at the Bombay Stock Exchange. The total income of the bank in the period under review was Rs 30,811 crore, 26.02 per cent higher from 24,450 crore earned during Q3, 2017-18. "Net interest income (interest earned less interest expended) for the quarter ended December 31, 2018 grew by 21.9 per cent to Rs 12,576.8 crore, from Rs 10,314.3 crore for the quarter ended December 31, 2017, driven by asset growth of 23.7 per cent and a core net interest margin for the quarter of 4.3 per cent," the bank said. Further, total balance sheet size as of December 31, 2018 was Rs 11.68 lakh crore as against Rs 9.5 lakh crore as of December 31, 2017.